It was the bowlers who shined for Afghanistan as Rashid's 3/13, Shapoor Zadran's 3/40 and Mohammed Nabi's 2/21 saw Bangladesh fall like a pack of cards in the 1st T20I at Dehradun. 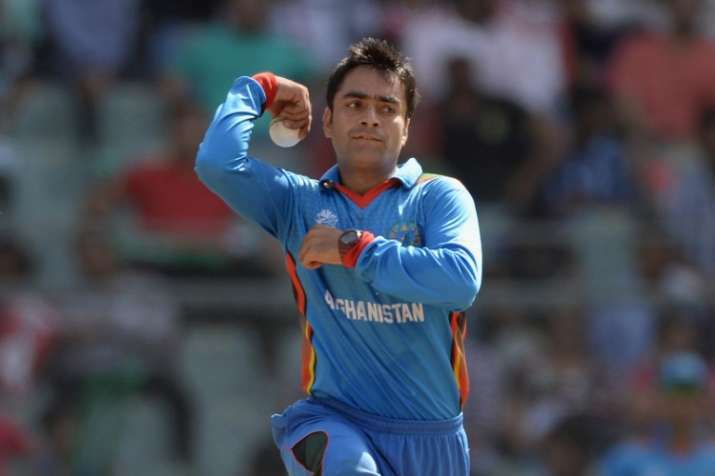 Leg-spinner Rashid Khan carried his lethal IPL form into international cricket as Afghanistan outplayed Bangladesh by 45 runs in the opening T20 of the three-match series at the Rajib Gandhi International stadium in Dehradun. The bowlers were ruthless as the Shakib Al Hasan side fell like a pack of cards. Rashid came to bowl in the 11th over and put his team in a strong position straightaway by removing the experienced Mushfiqur Rahim (20) and Sabbir Rahman (0) off his first two deliveries. Bangladesh could not recover from the blow and ended at 122 all out in response to Afghanistan's 167 for eight. The 19-year-old spin sensation was on target from ball one as he found the stumps of Rahim, who failed to execute a reverse sweep. It was the bowlers who shined for Afghanistan as Rashid's 3/13, Shapoor Zadran's 3/40 and Mohammed Nabi's 2/21 saw Bangladesh off in style. The next ball was a googly and Rahman had no idea where it was heading, trapping him plumb in front of the stumps. Rashid ended with figures of three for 13 in three overs. Bangladesh felt the pressure in the chase from ball one when the other in-form spinner Mujeeb Zadran had the experienced Tamim Iqbal leg before wicket. Spin all-rounder Mohammad Nabi (2/21) took the prized wicket of opposition skipper Shakib Al Hasan and pacer Shapoor Zadran struck thrice though he was a tad expensive. Earlier, Wicketkeeper-batsman Mohammad Shahzad (40 off 37) entertained the Dehradun crowd which turned up in huge numbers to watch the first ever international game in the city as well as the state. The wicket played slow as expected but Shahzad picked his spots well to bludgeon five boundaries. He shared a 62-run stand for the opening wicket with Usman Ghani (26 off 24), who too hit some lusty blows. The fall of the openers triggered a middle order collapse with Afghanistan feeling the heat at 91 for four from a promising 62 for one in the ninth over. It was off-spinner Mahmudullah who removed Najibullah Zadran and the seasoned Mohammad Nabi in the 14th over to bring Bangladesh back into the game. However, Samiullah Shenwari (36 off 18) and Shafiqullah Shafiq (24 off 8) displayed brutal hitting in the death overs to take the team to a challenging total on a testing surface. They both smashed three sixes apiece, much to the delight of the crowd. Bangladesh skipper Hasan had opted to field in the maiden international match played at the state of the art Rajiv Gandhi International Cricket Stadium.